If you're at all interested in the work being done by David Jaffe and the folks at Eat Sleep Play on the brand new Twisted Metal, the game's official demo is now available on the PlayStation Network. 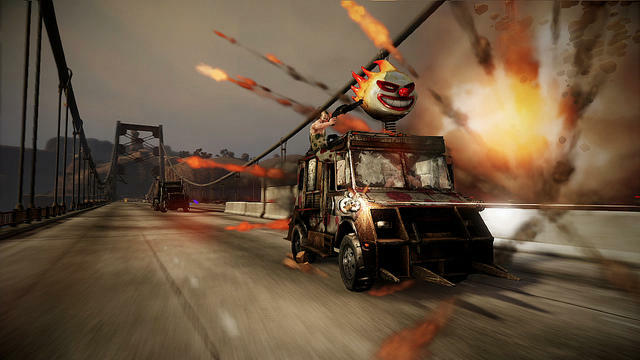 Twisted Metal is the relaunch of an old brand that hasn't seen a new console game since 2001. It's a series that was (and likely still is) adored by fans and known by almost everyone who has played games for a decent stint of time. Here's something that will probably shock the older gamers among us: the original Twisted Metal released way back in 1995. Holy crap, I feel old. I vividly remember playing the game for weeks on end at a friend's house when it first released. We were fans of the franchise and bought into the original, its sequel and the third title. I still remember being disappointed by Twisted Metal III; it just didn't feel as good as the other games. Despite attending every major gaming convention over the last four or five years, I have still not had a chance to check out this new Twisted Metal. I don't even think I've seen it in motion outside of trailers and assets. I'll be snagging this demo later today, for sure, and will probably wind up dumping way too much time into it than I can afford. I know going in that my first concern will be whether or not the gameplay model still makes sense under today's standards. It did back in the mid-90s, but it's certainly like nothing being produced today. The full Twisted Metal for the PlayStation 3 will release on February 14th. If you buy the game early, as this offer is limited to the first few batches produced, you'll get a voucher code to download Twisted Metal: Black (released on the PlayStation 2 in 2001) for free.